I so hope everyone had a fun and Blessed day yesterday with all of your loved ones. Our day was wonderful, and we all felt so blessed. 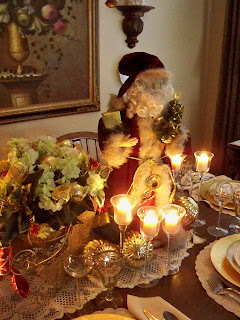 Just a few pics from Christmas Decor last year. Time to get out all of the boxes and start in for this year. 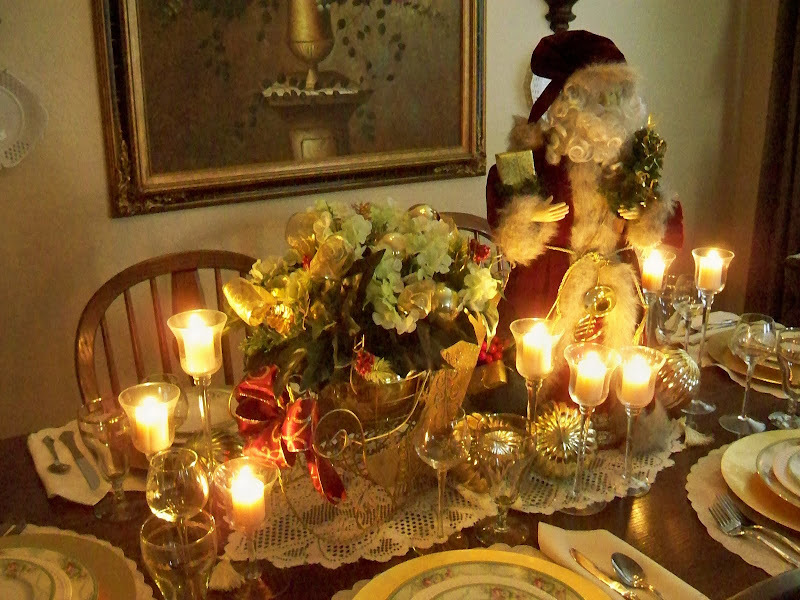 This is a look at my dining table last year. Love this Santa, it was a special gift from many, many years ago. We always do an old fashioned tree with ornaments from all the past years. Some from my mom, mil and tons that my children and grandchildren have made. I love every single ornament on our tree. Throw in tons of lights and to me it is perfect. I love this nativity scene, it was my Mil's and I am so thrilled that she gave it to me. This is the display that I had on the buffet last year. Ok, so let the fun begin. Your dining room table looks stunning, as always. I love the Santa! You have a lovely Christmas tree, too!! I am loving getting new ideas for this year, aren't you? I'm so happy you had a great Thanksgiving...we did , too. But I am not looking forward to unpacking Christmas boxes. Where are those elves when you need them?!!! What a beautiful centerpiece!! I like your tree because it is the way I do mine. More of what I call the traditional colors and style. Very pretty! We aren't having Thanksgiving until Sunday here so I have to wait until next week to decorate. Have a great weekend! Marty, very pretty and I look forward to this year's look. Beautiful! I like those stemmed candle holders on the dining table. Pretty tree and home. Love the leather winged chairs, too. Marty, I love all my ornaments too,, my tree always looks like a train wreck of ornaments that don't present a theme but each of them tell a story about our family. I'm trying to jog myself out of my self inflicted turkey coma and go down and start pulling the Christmas boxes out. So far....not so much. 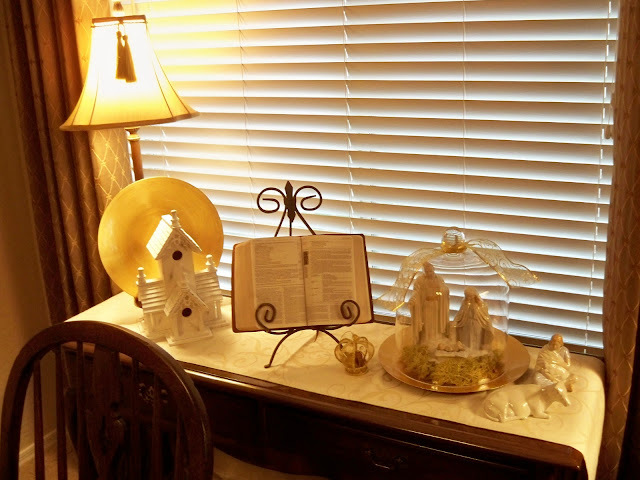 Thanks for sharing your 2009 Christmas, I particularly love the way you presented your Nativity with the cloche. I remember the photos and love revisiting them. Beautiful table and gorgeous tree! I look forward to seeing your creativity this season. Beautiful table Marty!Hope you had a Wonderful Thanksgiving! Hope the blessings of Thanksgiving continue all year long. How pretty your photos of Christmas Past look. Well, if that is what you call it...fun?!?! I am up to my knees in Thanksgiving tubs. Trying as always to fit all the new, and I didn't even buy that much, in!! Maybe tomorrow I will tackle the Christmas tubs. I am getting ready to do it though!! Blessings Marty, I love your decorations and I think you and I love the same type of ornaments. You have such a delightful way of fluffing your nest. HI Marty! All your table was so pretty!! Love anything you do!! It's always a joy to visit your house Marty. I love the little candles in the glasses. They look so sparkly and pretty. Yes the nativity scene on your occasional table is lovely. I've never seen so many lights on one tree before! It is all so gorgeous and inspiring...We are going with a handmade theme this yr so lil Sara can enjoy the decorating with us and not damage treasured family breakable ornaments. Look forward to seeing this years display from you also. This is beautiful Marty. I have all the clutter and cartons out and working away...taking it a tad slower this year and doing less, but still having fun. Hi Marty, Your tree looks amazing!! Love that Santa! Your tree looks elegant! I just can't wait to see what you do Marty. It will be spectacular for sure! Everything looks so pretty Marty. 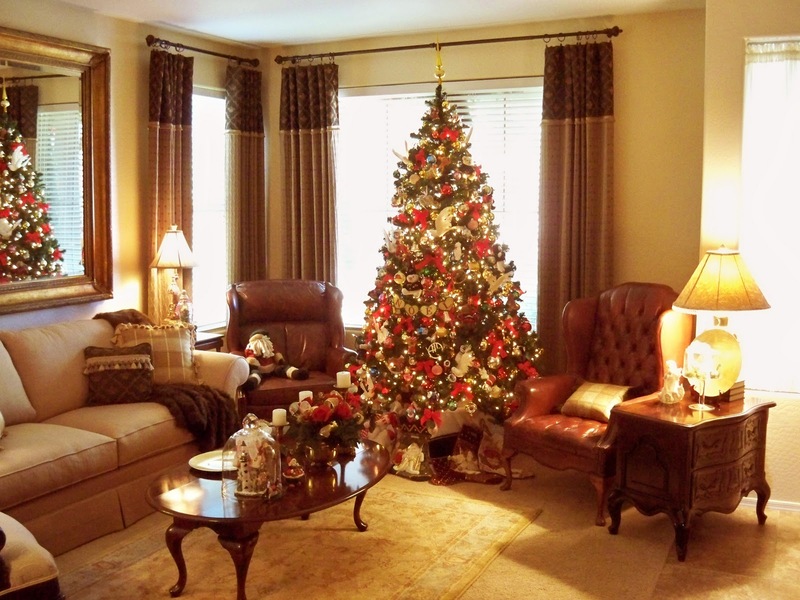 I love how the tree is so full of beautiful ornaments and I love all the ivory items displayed here. Sooooo pretty. Everything looks just beautiful!! I love your old fashioned tree, particularly in that setting. I just looks warm and Christmasy. I haven't begun to decorate. I always wait until after Thanksgiving so will be tackling it next week. Hope it looks half as lovely as yours. Don't know how you are going to top last year's beautiful Christmas decor, but knowing you, I bet you will. Lovely! I especially like the votives in the stemmed glasses. 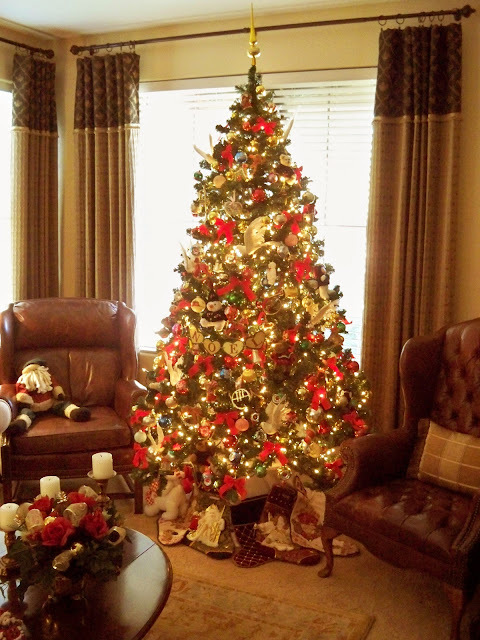 Its lookin a lot like Christmas at your house already..
"I LOVE your decor" and the sentiment behind it all is SO touching! LOVE that Santa(the ol' guy is another one of my obsessions that I can never have too many of). and the tree is GORGEOUS!!! as always!!! Love your Christmas tree...it's just perfect! Your tree and decorations from last year are gorgeous! I haven't gotten mine out yet - we're having a different grandchild spent the night each day of their Thanksgiving vacation. I can't wait to start decorating my home soon. I do remember your beautiful home during Christmas last year. I am hoping to do something with the cheese domes and cake plates and domes for your party. As you might remember, I don't have even one real cloche...but can't buy anything now. I have made it a point to do all my Christmas decorating without buying ONE single new thing. Don't you love a challenge.? Marty your home is beautiful no matter what the season, but especially so at Christmas! I can't wait to see what you do this year! Very cute! Can't wait to see what you do this year. I'll be working on my Christmas decor this weekend. FUN! You have that touch. I love your table and I love your tree! And old fashioned trees are my fave!! I'm anxious to see all those lovely treasures you recently purchased showcased in your Christmas displays! ! !This year, as I've begun getting the Christmas decor out, I've changed a few areas to accommodate some "new" finds. . .and put a few "oldies but goodies" in different places. "Shake it up a bit" as we say in retail! HA! 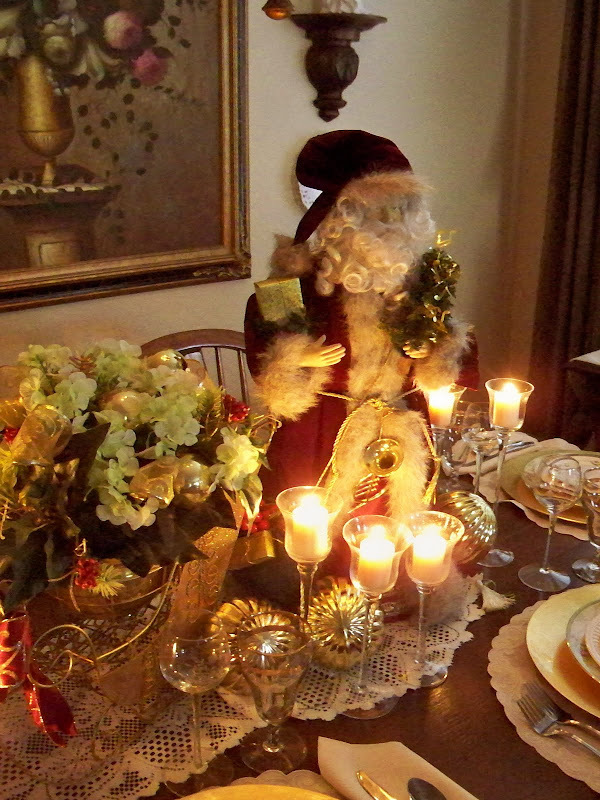 Your Santa on the dining table is such a lovely piece. Memories of Christmas past make the Christmas present more meaningful and give us hope that Christmas future will bring about good will to all! That is a gorgeous tree! It will be fun to see what you do this year! I really didn't put too much Fall out due to being sick. But I am not exactly anxious to start on Cmas either! Your s looks beautiful! You are my true inspiration! Aaawww! Its all GORGEOUS!!! I love it and it is sooo welcoming! The tree is beautiful. I LOVE all the lights on it. The candles are lovely too. They are my favorite. Very pretty tree. Our main tree has all our family ornaments on it also. I think it is much more personal that way. I'm just starting to get my things set out... I love coming to your blog to get some inspriation!!! You do such a beautiful job. Can't wait to see what you do this year. BTW... I was just out visiting my sister in AZ, I wonder if I was in your neck of the woods. Some day I would LOVE to meet up with some of the wonderful people in "Blog Land". Have a blessed holiday season!! !